Title: Bible Myths and their Parallels in other Religions Being a Comparison of the Old and New Testament Myths and Miracles with those of the Heathen Nations of Antiquity Considering also their Origin and Meaning. Relate humanity to spirituality and moral values. Many religions have symbols, narrative stories, traditions that intended to give meaning to life or to explain the origin of life or the universe. not bound to forces of nature ( divine miracles). Religious symbolism and iconography Description: The article explains how religious symbols and art (through the use of colors, gestures, shapes) provide a means to transfer the essential beliefs of a religion to its followers. These images are recognized by religious devotees and associated with beliefs and experiences. 1. Reflect on your experiences when viewing art in museums. How has religious art and sculptures impacted you? Based on your experiences, what similarities did you notice between the symbols present in religious iconography at a museum and at a place of worship? 2. How do religious symbols create meaning for members and provide a way for the religion to distill and disseminate its essential myths and rituals? belief that non-human entities are spiritual beings. Emily Durkheim saw deities (a supernatural being, who may be thought of as holy, divine, or sacred) as an extension of human social life. Sect is a religious organization that stands apart from mainstream society but is rooted in established religious traditions. Example: Christianity, began as a sect of Judaism; Jesus was a Jew. Cult - a religious movement or group whose beliefs or practices are considered abnormal or strange. Many cults are authoritarian and attempt to control the entire lives of their members. World’s largest religion. Three main branches. Émile Durkheim saw religion as a source of social stability. He argued that religions perform the social function of promoting solidarity by strengthening the collective conscience. He also felt that sacred symbols become powerful because people collectively invest them with power through their shared beliefs. Karl Marx argues that religion works to calm uncertainty over our role in the universe and society and to maintain status quo -Opium of the People. Promising rewards in the after-life rather than in this life (deflects attention from inequalities). In capitalist society religion role to maintain an unequal status quo. Several hundred exist in U.S. Description: The lecture given by Dr. Dale Tuggy clarifies Emile Durkheim’s theories on religion and how religion has developed into a complex social phenomenon. ​1. After watching the video, explain some commonalities (such as beliefs, rituals and norms) you observed between the different religions featured. 2. What examples did you see of myths, rituals, and symbols in the video? 3. How does religion shape how people understand the world around them? How does it help individuals understand ideas shared by most members of their faith? Description: This video is the first part of a detailed documentary called Hand of God. It is the story of an Italian family in Massachusetts who live in a tight-knit community which shares their culture, values, and religious beliefs. In the video, they divulge the effects on their family after their local parish priest sexually abused a son in the family. 1. According to the conflict theory, what control do the priests have over their parishioners and how can they exploit their powers? 2. In the video, many rooms in the family’s home have pictures of saints adorning the walls. What does this say about the family’s religious beliefs? How did the family’s devotion affect the decisions Paul made after the abuse occurred? 3. In the video, Paul talks about his childhood. How does the structural and functional theory explain the family and communal environment in which Paul grew up? Description: Professor Andrea Diem-Lane illustrates how new religious movements have developed. She explains the differences between sects, cults, and established religious organizations and describes how they each influence each other. ​1. Cults can eventually develop into a new religion or religious sect. What steps are needed for a cult to grow and become a part of mainstream society? What are some examples of new, established religious groups in the United States that originated as cults? 2. Some scholars of religion attempt to differentiate between problematic new religions and non-problematic new religions. According to the video, what are the reasons for this distinction? To whom would a new religious organization be problematic (refer back to religion’s influence on individuals, society, and other religious organizations)? Web Resource: New Survey Shows The World's Most And Least Religious PlacesDescription: The WIN/Gallup International organization carried out a global survey, which asked responders if they were religious believers or atheist. After surveying 64,000 people in 65 countries, they found that 63 percent of the respondents declared themselves as religious, while only 11 percent declared themselves as atheists. The article shows an interactive map displaying the countries where the survey was taken and how many people in each country responded to the survey. 1. Click on the displayed map. Which countries are the most religious in the world according to survey? Based on the article, why is religious devotion more prominent in these countries? 2. What are the least religious places according to the map? 3. 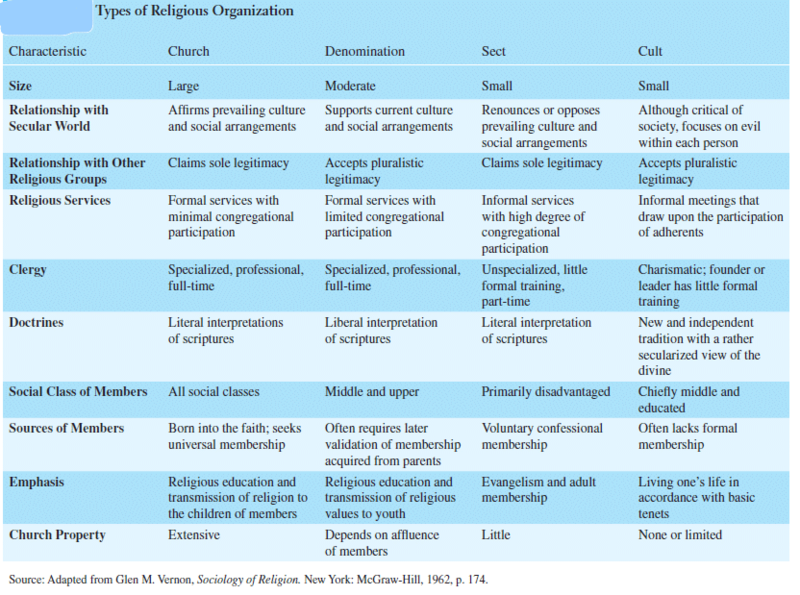 What role do religious organizations play in influencing the government in the countries with the most religious population? In your opinion, if there were no separation between governmental policies and religion in the United States, would that affect the population’s religious beliefs?